"Francis, go, repair my house, which as you see, is falling completely to ruin!" Thus spoke Our Lord Jesus Christ from the Crucifix in the Church of San Damiano to Saint Francis of Assisi, who took Our Lord’s words quite literally, and with his own hands rebuilt San Damiano and St. Mary of the Angels. But Our Lord was speaking of the whole Church, which Saint Francis did rebuild with his tremendous zeal for the love of Christ. The three orders of Saint Francis —the Friars Minor, the Poor Clares, and the Third Order —reinvigorated the Church with love for Our Lord Jesus Christ. Saint Francis’ response to Christ’s love for him was a complete giving of himself to Christ in return, and his joy in that total renunciation of self drew thousands in its wake. It was the joy of self-sacrifice, concentration on the love of God, to the extent of self-forgetfulness. Saint Francis began with nothing. He stripped himself of the very clothes on his back, covering himself with borrowed garments to show his complete dependence on the Providence of God, his Father in Heaven. He built his three orders from nothing, nothing but the Will of God. "What the Franciscans did once, they can do again!" These are the words of Fr. Eugene N. Heidt, the founder of the Franciscan Sisters of Christ the King. He established this community of sisters to follow in the footsteps of Saint Francis, helping to rebuild the Church through traditional Catholic education. Like Saint Francis, these Sisters would begin from nothing, completely dependant on the generosity of others, rebuilding the Franciscan way of life. Nothing less than the Franciscan approach would suffice —the total giving of self in response to Christ’s love for us; great, loving acts of trust in the Providence of God; confidence in God’s ability to work through weak human beings. The Franciscan Sisters of Christ the King. The congregation's founders, Fr. Eugene Heidt and Mother Mary Herlinda, are on the right. "God writes straight with crooked lines." Our foundress, Rev. Mother Mary Herlinda, quotes Fr. Heidt. When she told him she was too old to help found a new community, this was his response. She decided that her age would not stand in the way of God’s Will. Her unwavering faith in God, her dedication to the Rule of Saint Francis, and her unfailing courage provide the cornerstone of our foundation. Our prayer life centers around the Holy Sacrifice of the Mass offered by the priests of the Society of St. Pius X and also by priests who work with the SSPX. Next in importance is the Little Office of the Blessed Virgin Mary said in Latin and community prayers said in English, including the Holy Rosary. A new community for tradition ...what qualities should candidates possess? Like Saint Francis, like Saint Clare, candidates will have an all-encompassing trust in God’s Providence. They will give love for Love. Our Lord’s love for us demands the most generous response in return. Like Saint Francis, their response will be courageous. It takes a leap of faith to join a new community —not faith in the community itself, but faith in God Almighty. They will possess strength of character, the high ideals of a committed traditional Catholic, combined with the spirit of cooperation necessary for living the community life. They will also have a strong desire to help rebuild the Catholic social structure, particularly Catholic education, and a humble appreciation of the privilege of such a calling. The primary apostolate of the Franciscan Sisters of Christ the King is that of education. Those who do not teach shall work at various positions within the convent. There is no secondary apostolate in place, although our constitutions do provide for other endeavors. At this time, our apostolic efforts need to be focused in one area. The Third Order Regular of Saint Francis of Assisi constitutes a great branch of the Franciscan tree. Although the concept of third orders can be traced to the Benedictines, development of the third order gained momentum and structure in the thirteenth century. Saint Francis gave direction to third order members, although not named as such, in his Rule of 1223. At that time, men and women third order members lived pious lives in the world, but some of these soon withdrew from the world to form communities. Italy, Germany, France, and the Netherlands all saw the development of Third Order Franciscan communities of both men and women. Over the next few centuries, the Sisters in various Franciscan communities adjusted to the different requirements of Holy Mother Church regarding such things as cloister and apostolate. For example, at one point, monastic cloister was imposed on all communities of women, whether they were nuns or sisters. This in turn affected the apostolates. However, the need for semi-cloistered sisters as well as fully cloistered nuns became more acute during the eighteenth and nineteenth centuries. Revolutionary upheaval engendered greater and greater need for communities of Franciscans and others who could be involved with works of charity in the active apostolate, while maintaining contemplative prayer and community life. In order to bring the Franciscan Third Order Regular Rule into conformity with the 1917 Code of Canon Law, Pope Pius XI promulgated the Franciscan Rule of 1927 on October 4, given to all congregations of men and women of the Third Order Regular of Saint Francis of Assisi. The Franciscan tradition as lived before Vatican II by the various communities of the Third Order Regular embodied the active-contemplative way of life. The prayer life of the sisters provides the foundation and the strength for the active apostolate. The desperate need for traditional Catholic teaching sisters inspired the foundation of the Franciscan Sisters of Christ the King. Growth has been steady, and the community quickly outgrew its accommodations. Fr. Heidt kindly provided the first house, which quickly extended to a second house a mile away, with a small nearby mobile home added as the third facility. Making do is a good Franciscan tradition, but the arrangements were not conducive to community life as it is meant to be lived. After much consideration, Fr. 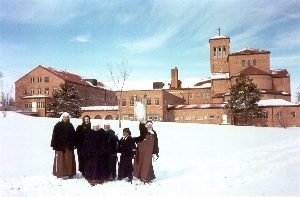 Heidt and Mother Herlinda decided to purchase a large empty convent in Kansas City, Missouri. This vacant facility was built in the 1940’s as a Benedictine Convent of Perpetual Adoration and was once the metropolitan center for devotion to the Blessed Sacrament, so it is quite famous in the area. When the Benedictines left in the 1980's, it was used for a number of years by a non-Catholic group as a home for unwed mothers and then as a charter school. However since this complex is suitable only for convent use, and thereby is difficult to convert for any other use, it was offered for sale. The imposing three-story, brick complex lies on a hill with 6.5 acres surrounded by a wrought iron fence within the metropolitan area of the city. The beautiful Romanesque chapel majestically stands over four stories tall, containing within a marble-clad and pillared sanctuary with a rounded apse, original choir stalls with a marvelous, working pipe organ and a large nave. Attached to the chapel is a six-story bell tower, visible from a great distance. With the purchase of this convent and the necessary debt, we are moving forward in confidence, relying on the Hand of God to supply our needs through the charity and generosity of our fellow Catholics. "May you be filled in Heaven with the blessing of the Most High Heavenly Father, and may you be filled on earth with the blessing of His beloved Son, together with the Most Holy Spirit, the Paraclete, and all the Virtues of the Heavens and all the Saints."